Downtown Frankfort features an array of parking options, from garages to surface lots to on street parking. 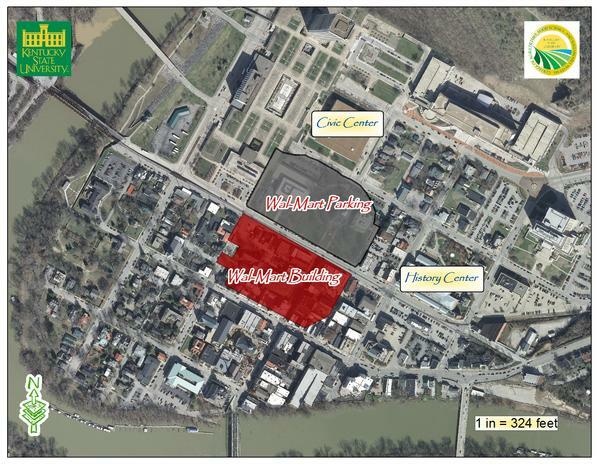 Here's a handy little map to show where the main parking options are in Downtown Frankfort. 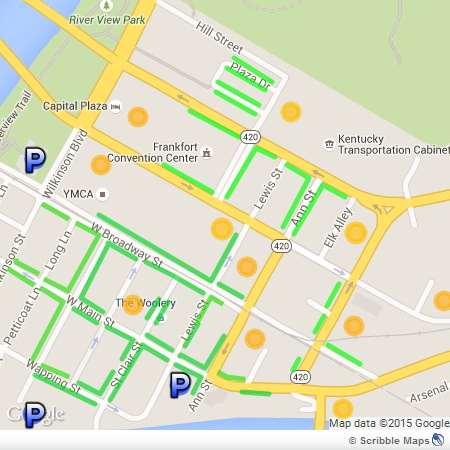 Bright Green lines indicate FREE 2-hour on-street parking (time length exceptions may be marked curbside). You are WELCOME to park in the parking spaces along these streets. Please note: 2-hour parking limit is enforced Mon-Sat from 8a.m.-5p.m. Blue "P"s indicate parking lots and garages that are open to the public. The garage accessible from Ann Street is a pay-to-park deck during work hours. Yellow circles indicate additional lots and garages that are privately owned. Some allow public parking after hours. An additional public lot is located across the Singing Bridge, at the corner of 2nd Street and Conway (caddy-corner from Full Circle Gallery & Studio). It is accessible from Conway Street.